Typically a right of way problem will involve also access problems or the determination of the ownership of the ground or indeed the ability to develop or not develop. It is a complex area of the Law but one we know and understand. Because of Ian’s experience in these matters he is able to give very quick usually off the cuff advice concerning matters of rights of way and rights of way problems. This firm never charges for initial advice, we always want to understand a client’s problems properly before we advise them of how their problem can be moved forward and indeed whether we can help them. That advice is always given free irrespective of the length of any consultation necessary to get to the bottom of the facts that are relevant. 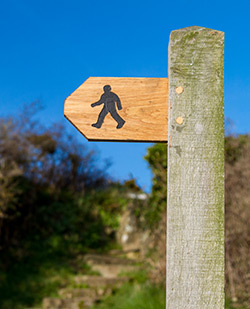 Do not hesitate to contact Ian Procter at Green Solicitors for any problem relating to rights of way. Ian Proctor Rights of Way Solicitor Clitheroe, Blackburn, Longridge, Burnley and Nation wide.